This is the second in a series of musings and accompanying videos with Vancouver-based Cipher Research Ltd, which evaluates exploration and mining companies for investment. Once again, we assess a segment of the gold resource sector. 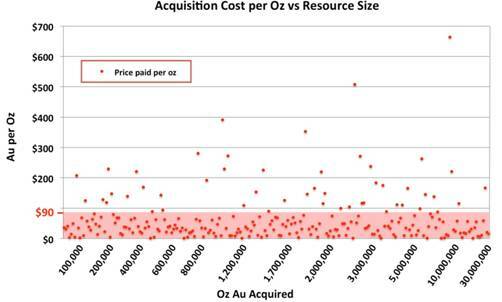 Our first musing was posted in early February and titled The Real Cost of Mining Gold. It evaluated seven major gold miners over the 11-year bull market from 2003-2013, showed how and why they failed to profit and reward shareholders, and provided a solution for the future, i.e., a value versus growth philosophy. Three short videos on the subject can be accessed here: Mercenary Geologist Videos. Today, our subject is the value of an ounce of gold in the ground. Venture always flows where potential reward is perceived to have the lowest risk. In my opinion, advanced explorers and developers often offer the best risk/reward profile in the junior resource market. There is a plethora of companies to choose from in all segments of the resource sector. For any speculator, the challenge is to separate the many pretenders from the very few contenders. This is an especially daunting task for the retail lay investor. In this musing, we provide insights based on decades of experience evaluating companies and their projects. We examine a 24-year takeover history of advanced gold explorers and developers to determine the real value of gold in the ground and develop a set of criteria for assessing any company and its flagship project for investment. Analogous to the major miners, we find that the quality of ounces of gold is far more important than the quantity of ounces. Share structure: should be tightly held with significant holdings by insiders and management. People: should have technical expertise and experience with past successes and not a series of failures. Project: should have favorable geology and geopolitical jurisdiction with an experienced and successful geological and engineering team. Working capital: should have significant cash on hand and/or the ability to raise funds without severe dilution. Many analysts, money managers, newsletter writers, and pundits promulgate the idea that management is the most important criteria for speculation in a junior resource company. Cipher and I vociferously disagree. We cannot recall any advanced explorer or developer taken over for the attributes of its management. We submit that Project is King in evaluating any gold company for speculation or acquisition. An early-stage explorer has no tangible value. The company’s market capitalization is simply a speculative valuation based on investors’ perception of its management, projects, and potential for share price increase. The successful junior exploration company makes a gold discovery and drills it in sufficient detail to table a mineral resource estimate. Once there is an in-the-ground resource, an informed valuation can be assigned to what has become an advanced explorer with a gold deposit. To become a potential developer, the company performs engineering studies on the resource to determine the amount of gold that can be converted into economic reserves (ore). Once reserves are quantified and assigned an economic value, the company can either raise money to build a mine or sell the asset or a portion of it to another miner. At any juncture in this process, the real value of said mining project is derived solely from the level of confidence that it will produce a quantity of ounces of gold at a profit in the future. So how do we evaluate a gold project for possible investment? Both Cipher Research and I employ a peer valuation model based on the value of gold in the ground. My methodology is simpler than Cipher’s, which employs a detailed technical and financial analysis. Here’s the basic premise: An ounce of gold in hand is currently worth about $1200. Gold contained in rock at concentrations or amounts not economic to mine is worth zero dollars. It follows that an ounce of gold “in the ground” is worth somewhere between nothing and the current spot price. A gold project’s value is then expressed by a simple formula: Value = Quantity x Price, i.e., the number of ounces that can be potentially extracted at a profit times the peer price of gold in the ground. In my methodology, I assess the geology, deposit type, geological team, land, access, infrastructure, and geopolitical and environmental jurisdictions to determine if a project warrants further interest. If it passes initial muster, the grade and tonnage of the resource and/or reserve estimates allow me to assess potentially recoverable ounces of gold. I then take the market capitalization of the company and divide by the number of ounces to calculate a market value per ounce of gold in the ground. As a contrarian, I am looking for companies that are unknown, unwanted, and undervalued at any particular juncture. My trading philosophy, the Power of Two, has been well-documented over the years. For those with further interest, the detailed methodology is discussed in this musing (Mercenary Musing, May 10, 2010). By comparing a targeted project and company to a group of peers, I can determine the ones whose ounces are drastically undervalued. Employing the efficient market hypothesis, those few companies have potential for share price doubles and are candidates worthy of speculative buys. Cipher Research has a similar philosophy but employs a much more in-depth analysis. While Cipher realizes that take-over is not the only option for advanced explorers & developers, it is one that can be accurately measured and provides a reliable benchmark price for an ounce of gold in-the-ground. Therefore, the Cipher principals analyzed 253 take-overs in the gold sector from 1990-2013 to determine the value range for an ounce of gold in-the-ground. Their method relies on the principle of substitution, i.e., the gold deposit being valued is compared with the transaction value of similar properties. 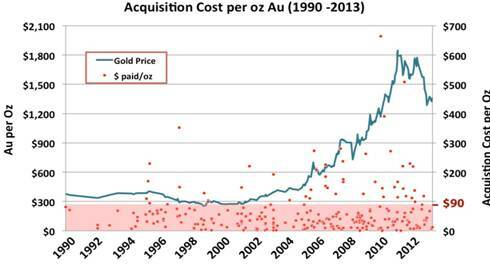 Note the vast majority of these transactions occurred below $90/oz Au in-the-ground and, except for more outliers when the price went exponential from 2005 to 2012, there is very little correlation with the price of gold. The following table shows that only a slight premium was paid for pre-production or producing mines versus feasibility-stage and development projects. There is a larger spread in valuations based on jurisdiction, with deposits in Asia and Latin America commanding a premium over North America and Africa and Europe in the mid-range. The reasons for this are unclear to us. Based on 253 gold deposits acquired from 1990-2013, Cipher calculated a median benchmark value for an ounce of gold in the ground at about $40 and established that 80% of the ounces were valued at less than $90. Note that Cipher’s treatment includes all categories of 43-101 qualified resource estimates: measured, indicated, and inferred resources. Measured and indicated resources can be economically evaluated and a portion converted into proven and/or probable reserves; i.e., “ore”, the part of a mineral deposit that is mineable at a profit (Mercenary Musing, August 25, 2008). However, the confidence level of inferred resources is insufficient to allow the application of technical and economic factors or enable an evaluation of economic viability worthy of public disclosure (CIM Standards on Mineral Resources and Reserves, 2000). Simply put, not all ounces are created equal. At any given time, the level of confidence that gold can be economically mined, processed, and refined into pure gold bars and the projected profits from sale of said gold determines the value of the ounces in the ground. This is a part of what makes some gold deposits worth $90 an ounce while others are valued at $10. However, there are many other variables that enter into the equation. Determining the confidence levels and projected margins of a gold project requires studies by independent engineers and geologists, the “qualified persons”. There are three types of engineering studies, listed in order of increasing level of confidence: Preliminary Economic Assessment, Pre-Feasibility Study, and Feasibility Study. Each report determines the overall grade and tonnage of the mineral resource; the latter two also determine the reserves that can be economically mined, processed, and recovered. All studies require informed assumptions and estimates of many technical and economic variables. Slight changes in any of these factors can drastically affect the potential viability and economic value of a gold deposit. The price of gold is the most critical variable. It affects not only cash flow and profit margins but also the cut-off grade of the deposit. The cut-off grade is the minimum grade of rock that can be mined, processed, and produced at breakeven cost. Minor changes in cut-off grade can result in huge changes in the size of resources and reserves. The mineable portions of a gold deposit are the ounces contained in the reserves. Only the mineable ounces that can be produced at a profit have actual value. Because of dilution and mining losses, reserves will always be less than resources. The geometry of a gold deposit is a critical factor. For example, mineralization outside or below the depth of a potential open-pit or below the depth of a shaft has no actual value. The metallurgical process required to recover gold must be thoroughly understood and tested. Many mines fail because of poorly designed or underperforming mineral processing and recovery facilities. The operating expenses (OPEX) include all the direct costs of producing an ounce of gold. OPEX is estimated from peer costs at similar mines operating in similar jurisdictions. The capital expenditures (CAPEX) are the costs to build a mine, increase production, or upgrade facilities. CAPEX is accounted for by spreading it out over the life of the mine as a depreciated expense. Most of these expenditures occur prior to the commencement of mining. Sustaining capital costs are expenditures to maintain levels of production. Initial construction of a mineshaft and stripping of an open-pit are examples of CAPEX while deepening a shaft or laying back a pit are examples of sustaining costs. Companies and engineering firms may move costs from CAPEX into sustaining capital in order to shorten the initial payback period and make the economics of a deposit appear better. Cipher Research critically examines all the assumptions and key variables used in technical and engineering studies on a gold project. It often makes adjustments to the company’s resource model before running a detailed financial analysis to determine the economic viability of the deposit. To understand Cipher’s process, let’s look at a case study for an advanced gold exploration and development company. It was spawned from a shell in 2005 and was acquired by a mid-tier gold miner in 2013 for $370 million. Net of cash, the miner paid $300 million for the junior’s gold project. Total tonnes decrease from 376 to 223 million tonnes or 41%. Grade increases from 0.88 g/t Au to 1.21 g/t Au but is still well-above two times the cut-off grade. The company completed two Preliminary Economic Assessments (PEAs) on this resource. Using the 0.35 g/t Au cut-off and a gold price of $1250/oz, the last one generated an after-tax NPV at 5% discount of $452 million. Total tonnes decreased by 36% from 376 to 239 million tonnes and total gold decreased by 26% from 10.7 to 7.9 million ounces. Shortly before the takeover announcement, the company published a Feasibility Study using the same gold price and cut-off grade as the PEA. It showed an after-tax NPV at 5% discount of $931 million. This study also provided a sensitivity analysis using $1250/oz that had an after-tax NPV at 5% of $721 million. Note that total tonnes decreased 46% from 214 to 116 million tonnes and total gold decreased 43% from 7.1 to 4.0 million ounces. Since engineering studies calculate Net Present Values for a project, we can evaluate the sensitivity to factors such as gold price, discount rate, operating costs, and other key variables. Only 4.0 million ounces of the original 10.7 million ounces resource were converted into proven and probable reserves, a decrease of 63%. The global resource is mildly sensitive to changes in cut-off grade, with the total gold resource decreasing by 19% between 0.35 g/t and 0.5 g/t cut-offs. The overall grades are significantly more than two times the various cut-offs, indicating a robust deposit. The global resource was valued at $28 an ounce in the takeover, well-below the median benchmark price of $40 for gold in the ground for 253 takeovers. The base-case value for the PEA was over twice the actual takeover price. The base-case NPV for the Feasibility Study was well-over three times the actual takeover. Note that a base-case supposedly has the highest level of confidence in an engineering study. The sensitivity case for the PEA using $1250 and a 10% discount is closest value to the actual take-over price. However, that study used 7.9 million ounces, almost double the feasibility reserves. The sensitivity for the Feasibility using $1250 and 10% is the most reasonable NPV approximation, but it is still 35% above the takeover price. Cipher’s adjusted NPV of $370 million is still too high but is better than the company’s engineering study in matching the eventual takeover price. In this case study, the discrepancies between the actual takeover price and published engineering values illustrate the necessity for careful due diligence when evaluating gold projects. Unsupported and unrealistic assumptions and variables are commonly used by consulting engineering firms when calculating future cash flows. Now that the real value of this gold project is established, let’s compare it to the company’s share price and market valuation over an eight-year history as it raised funds via a series of private placements to explore and engineer the project. The junior company started as a shell that acquired a project with mineralized drill intercepts and a well-defined target area. It did a 4:1 stock split at the end of Q3 2004 to have 14.0 million shares outstanding and then completed a reverse takeover. The stock began trading in 2005 with a private placement at 25 cents that raised $3.4 million and positioned insiders, pros, friends, and family. This was soon followed by a raise for $2.0 million at 63 cents that again placed those closely connected with the company. In 2006, the company delivered encouraging drill results and completed a large brokered raise at $1.17 for $14.5 million. At that point, it had 43.3 million shares outstanding and had raised $20.0 million in the public markets for an average price of 46 cents. Subsequently, the company raised $300 million by issuing a total of 56.7 million shares at an average price of $5.31. The financings included a $75 million bought deal at $12.80 during the top of the gold market in late 2011. It was led by two of Canada’s largest brokerage firms. In analyzing its history, the insiders and other early investors acquired 43% of the company at an average price of $0.46 per share. If they had held onto all of their shares until the takeover occurred, returns on investment would have been over 700%. Investment bankers and brokers would have collected fees in cash and broker warrants on the $300 million worth of private placements and public offerings; corporate finance fees would also have been paid on the $370 million takeover. Assuming industry average rates for these fees, investment bankers and brokers would have made over $35 million and likely closer to $50 million during the company’s life. The investors who bought in for $300 million or 94% of the total money raised and acquired 57% of the shares at an average price of $5.31 did not fare well at all. On average, they lost over 30% of their investment. And pity the poor souls who were part of that $12.80 private placement on a gold deposit whose real in-the -ground value was never worth more than its acquisition price of $3.70 per share. The blue line is the actual share price of the target company. The first three green Xs are the unadjusted resource values per share for three published resource estimates. They are calculated by multiplying the number of ounces in the global resource times $90 per ounce then dividing by the number of shares outstanding at the time. The second three green Xs are the unadjusted resource values per share for three engineered resources studies (two PEAs and the Feasibility). They are equal to the NPVs divided by the number of shares outstanding at the time. The red Xs represent Cipher Research’s per share valuation after adjustments were made for project stage, various economic factors, and future dilution required to finance the company to its next milestone. Note that the unadjusted resource values (green Xs) represent the project value as it commonly would have been perceived by the market. Most investors routinely assume that resource estimates and/or NPVs published by an independent engineering firm are an accurate representation of a project’s value. This is often not the case. Because the consulting engineering firms operate in a highly competitive business environment, they are hired with the expectation of tailoring technical reports to the client’s needs and desires. As an aside, have you ever come across a negative feasibility study? Remember folks, for every failed mine, there was a positive feasibility study. For this reason, investors must scrutinize engineering reports carefully. It is often necessary to make adjustments to the assumptions and key variables to arrive at a more realistic project value at any point in time. The Cipher Resources value model represents the upper limit of what it deems a company’s intrinsic value to be. A company is considered a “buy” when trading below this level; a “hold” when at or slightly above; and a “sell” when significantly above. This case study shows that for almost its entire history the company was trading at or well above its intrinsic resource value. Therefore, it would not have met Cipher’s criteria for investment. Likewise, the company never made it onto my radar screen. By the time I was aware of the gold discovery in 2006, it was already overbought and overvalued. When I visited an adjoining property in June 2007, its stock was trading above $5.00 a share. Because the company was never undervalued with respect to its peers, it never gained my interest. That said, it is beyond the ability and experience level of most retail lay investors to perform such a task correctly and efficiently. Therefore, laymen must rely on experts to provide analyses and stock recommendations. A technical or financial mining industry background and years of experience evaluating projects and companies are, if not necessary, certainly invaluable in this endeavor. Too often we find the so-called “experts” that lay investors choose to rely upon are not experts at all. Instead they are brokers, investment bankers, or in-house promoters whose primary interest is in collecting commissions or fees for selling stock, deals, and private placements, or earning consulting fees from the company. Folks, please make sure that you understand the motivations of any expert, analyst, broker, promoter, writer, or talking head whose advice you choose to follow. Does he own shares in the company and at what price? Is he participating in the deal or placement with his own personal funds? Will he collect a commission or fees for selling you the stock or deal? Does he get paid to promote the company via fees, stock, and/or options? Is he or his firm underwriting the deal for a fee, commission, and/or warrants? Will he give you a full disclosure statement regarding his financial relationship with the company and/or project? We urge you to follow only those experts who you know and trust. Be certain they have your best interests in mind before investing your hard-earned dollars into any speculative resource stock. Doing this simple task diligently can prevent you from being in that group of uninformed or perhaps misinformed “investors” who so many brokers and bankers prey upon; e.g., those who bought the aforementioned $3.70 deal for $12.80. I always fully disclose my financial involvement with any company that I write or speak about (e.g., stock position at, below, or above the current trading range; website sponsorship; consulting agreement; etc.). Realize also that I am talking my own book when presenting stock picks; but note I always put my mercenary money where my mouth is. I trust this musing has afforded insight into the concept and process of determining the real value of gold in the ground and that understanding a project’s intrinsic value can make you a better investor. May you live well and prosper in your speculations and investments.